A great place to start learning about fossils is right in your "backyard", with your official state fossil. This page lists all of the designated state fossils (and some official state dinosaurs and fossiliferous gem stones) as a launching point for learning about fossils in your state and neighboring states. Do you know your official state fossil? If not find information on each US state fossil, state dinosaur, and state stone or gem that is a fossil! Includes images, descriptions, taxonomic hierarchy, and a history of the state fossils representing the state symbols for each of the 50 states. Lists their basic characteristics. Fossils are any evidences of ancient life preserved in stone or other material. 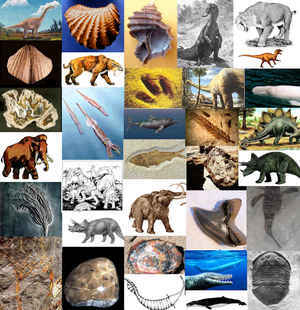 Fossils can include molds, casts, defecation material, stomach stones, bones, footprints, trails and burrows. Fossils can be preserved in sediments, tar pits, and amber, and are usually the result of being covered rapidly. Every state in the United States has a State Bird and a State Flower, but not every state in the US has a State Fossil. California has chosen the Pleistocene Sabre-Toothed Cat, Smilodon fatalis familiar from the La Brea Tar Pits. And Alaska has the Woolly Mammoth, Mammuthus primigenius. And, yes, there are the dinosaurs (Colorado's Plated Dinosaur, Stegosaurus stenops , New Jersey's Duckbilled Dinosaur, Hadrosaur Hadrosaurus foulki, or Montana's Duck-billed Dinosaur, Maiasaura peeblesorum, and even sets of dinosaur footprints (both Connecticut's Dinosaur Tracks and Massachusetts' Dinosaur Tracks). Nevada recalls its days as beachfront property with a Triassic Ichthyosaur, Shonisaurus popularis. Idaho has chosen an early horse Hagerman Horse Fossil, Equus simplicidens. Alabama's, Zeuglodon - whale and Mississippi's Prehistoric Whales are a pair of Eocene archaeocete whales, and Vermont has the most recent fossil, Charlotte, the Vermont Whale, a Beluga White Whale (Delphinapterus leucas) from an arm of the sea that extended into Pleistocene Vermon. Pennsylvania's Trilobite and Ohio's Trilobite are both represented by Trilobites. New York has a less-familiar Sea Scorpion, Eurypterid, a precursor to the earliest fishes, and Maine has gone out on a limb with an early vascular Plant from the Devonian, Pertica quadrifaria. Some of the State Fossils are generic, like Georgia's unspecified Shark Tooth, but Illinois is represented by a mysterious Tully Monster, Tullimonstrum gregarium from the Carboniferous swamplands. Wyoming state Dinosaur - Mar 18, 1994.